I purchased this pitcher plaque at the thrift shop for a couple bucks. I painted it with Annie Sloan Chalk Paint and stenciled it with "Flowers" in French and added a little shelf. I liked the finished project but was never happy with the light blue paint showing through on the sandpaper distressed edges. So I re-painted the whole thing with Rustoleum Chalked Paint in Chiffon Cream. This time I didn't sand the edges to distress, I used my FolkArt Layering Block and Ceramcoat Acrylic Paint in Walnut Noyer . Details on the layering block are here. The shelf was made with this wooden plaque. I cut it in half and screwed it on the cutting board from the back. 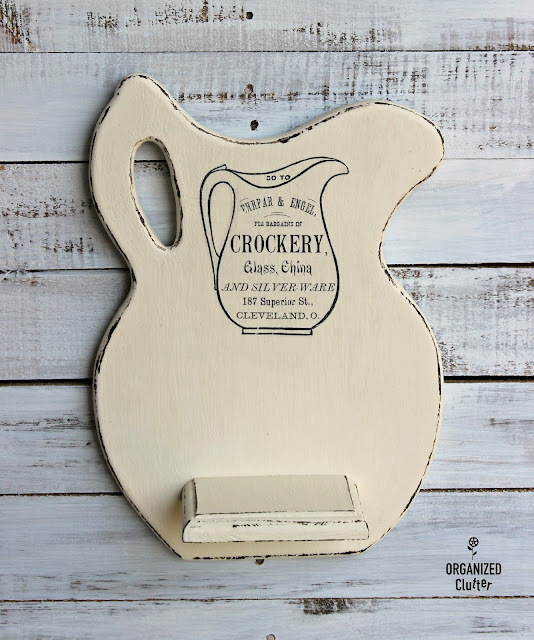 Instead of adding a French stencil, I used this ironstone pitcher graphic from the Graphics Fairy and the Mod Podge Image Transfer method. I brushed on some Varathane Clear Matte Finish Soft Touch Polyurethane to protect the transfer and chalk paint. I am thinking about hanging the plaque in a spare bedroom. 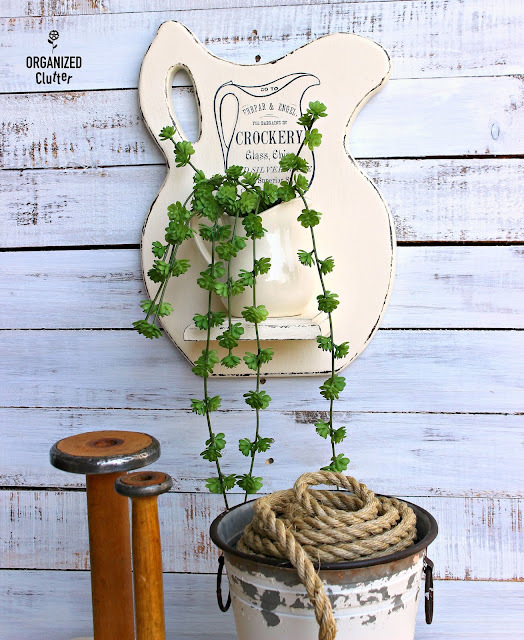 I have a little pitcher to put on the shelf and I love this faux hanging sedum from Allstate Floral. I will be sharing the bedroom mini makeover when complete! I will be using many more of my thrift shop projects in the makeover. Really cute! I love how you updated it and added the shelf! Oh I love the plaque and you really did a great job on it. Oh I love how you gave this new life! How creative to add a shelf! Very cute upcycle Carlene! Love the image transfer! 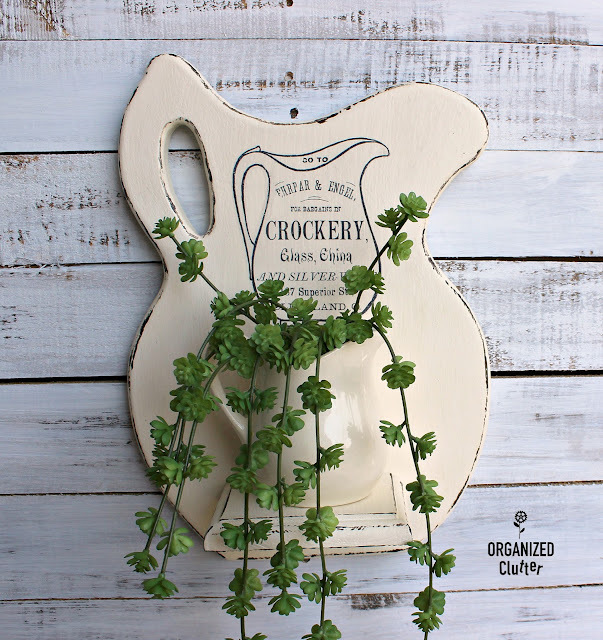 It looks great on the pitcher & love the distressing of the edges. Nice! I love how inspired you are! Beautiful! Pinned. You do share the best ideas.